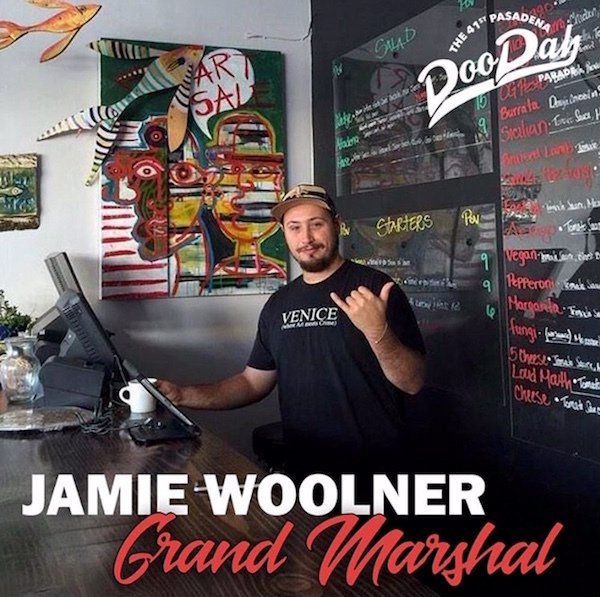 Doo Dah Parade Cuts Loose This Sunday in East Pasadena! 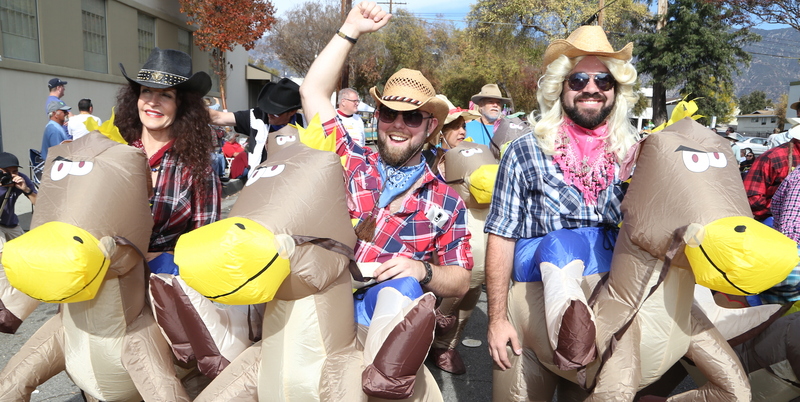 (November 15, Pasadena CA) The Occasional Pasadena Doo Dah Parade celebrates 41 years of irreverent frolicking on the streets of Pasadena this Sunday, November 18th. On Doo Dah day, more than a thousand participants will be joining in the fun from all over Southern California. Over 90 entries, including zany art cars and floats, eccentrics, disruptors, political pundits, artists, lone wolves and steam punks, will accompany a legion of revelers past the mom-n-pop shops along East Pasadena’s shady tree-lined streets. In fact, this year’s parade features the more new entries than ever before! MORE INFO: This year’s lineups includes LuluBob Space Shuttle, Wisdom Arts Lab. Howdy Krishna, Flying Baby Field Goal, Professor Pigeon’s Flying Library, Radioactive Chickenheads, Dr. Steele’s Army of Toy Soldiers, Unicorns with Palaces, L.A. Derby Dolls, Nintendo Kids, Free Thought Society, Bearded Ladies, Saucer from Bakersfield, Titanic, Mister Clops, Gay Chefs, Partying Parrotheads, Murrugun the Mystic Sword Swallower, Trashion Show, The World’s Tallest Girl Scout, Sneaky Haircuts, Devilicious, Honeybee and the Paddlewheel, Recumbent Revolution, Clown Doctors from Outer Space, and Doo Dah’s 2018 Queen Jennipha, King Clayton and Grand Marshal , among many others. Secret Santa, Doo Dah’s take on the North Pole icon, will close the conga line and ring in the holiday season. And… not a rose will be harmed in the making of this parade! PARKING: Plenty of easy street parking is available. Parade route is 1 mile west of the Sierra Madre Villa Gold Line Station. City busses go directly to the area. Call Uber or take a Metro bike! MEDIA PARKING: MEDIA VEHICLES ARE ENCOURAGED TO PARK ON STREETS ADJACENT TO THE COLORADO BOULEVARD PARADE ROUTE FOR EASY ACCESS. MEDIA STICKERS SHOULD BE OBTAINED IN THE PARADE STAGING AREA AT 79 N. VINEDO AVENUE, PASADENA, CA 91107 (1 block North of Denny’s Restaurant). FOOD TRUCKS will be located on Virginia Avenue next to Poo Bah records (at 2636 E. Colorado Blvd.). OFFICIAL AFTER-PARTY: American Legion, 179 N. Vinedo St. (2 blocks North of Parade)) immediately following the event. New Astroturf, more live bands, dancing, cheap food and drinks!! $3 cover. PooBah Records, one of Pasadena’s favorite independent music stores, will feature live in-store performance and DJ at 2636 E. Colorado Blvd., right on the parade route. The 9th Annual After Party at MEOWMEOWZ! is happening at 2423 E. Colorado Blvd., featuring the Radioactive chicken heads and Count Smokula. Free and all ages welcome! Starts directly after the parade. Old Towne Pub, The Sooper Dooper Unofficial Doo Dah After Party at 22 E. Holly Street serving craft beers, 3 bands and raucous fun in Old Town Pasadena. Read the Pasadena Now article. It was a lively queen’s caucus yesterday in East Pasadena to decide who would be crowned Queen of the 2018 Pasadena Doo Dah Parade. Among a boisterous crowd of onlookers, Jennipha-Lauren Nielsen showed amped ability to have fun and also be committed to her community. As clued in as she is on fun, “Jenny” has a serious side too. She is co-founder and CEO of the One World Project, a community-based initiative focussed on providing programs and advocacy in an effort to address problematic global issues. Nielsen was also student body president at CalState L.A., and student representative for the CSULA Foundation, which provides community expertise, oversight and advocacy to fundraising efforts for higher learning. Jenny is no stranger to royal accolades. She was crowned Miss California World in 2011, with a platform for funding higher learning, girls and minority education especially in STEM. She is currently an avid spokesperson for gender equality and disability rights. After crowning, she told Patricia Hurley, Parade Organizer, that she hopes to bring the group “Indivisible” into the parade for their first time. A close contender this year was Steven Johnson who transformed into “Princess Covfefe.” He inspired judges and onlookers with his wit and talent, including a virtuous performance of Scott Joplin rags on the piano. He will join the royal court on Doo Dah Day! The 41st Occasional Pasadena Doo Dah Parade will be held on Sunday, November 18th, stepping off at 11:00am on the streets of East Pasadena. Entries are still invited! To enter the parade simply go to the website and get the entry form. Call for more information on how to enter (626) 590-1134. Public Information Number: (626) 590-7596. Results from the tryouts are posted on the Pasadena Doo Dah Parade website. Entry Forms and further information to be found on the website. WHAT’S HAPPENING: The ‘Other’ Queen in Pasadena’s parade town will be selected at Tryouts this Sunday. Individuals of all genders, shapes, ages, and persuasions, will be testing their fate to become Queen of the Pasadena Doo Dah Parade. Contestants will face equally-costumed judges, who include many former queens, veteran parade entrants, tryout supporters and the curious public. The town-hall setting with long tables in beer-fest style, hot sandwiches, “Calvin Banks and the Tellers,” and Doo Dah House Band, “New Astroturf,” will set the mood for the lively Queen selection caucus. Previous candidates have included Count Smokula, Mr. Peculiar, Xexchron with Theramin, Sabrina the Stimulus Package, Rooby Breastnut, Dolla A Holla, Queen Vee, and Ms. Land & Ms. Sea. Last year, Judges selected Armond Anderson Bell, otherwise known as “Queen Imani Phoenix” who won over 30 judges hearts with her passion and Aretha Franklin impersonation. HOW? Each Queen Hopeful will have but a few minutes to WOW the Judges. Microphone and drumroll, provided. They will be ready to show and tell us why they should be Queen, often accompanied by a ring of loyal hecklers! People can buy their way into being judges by purchasing two beers for the parade organizers! LIVE MUSIC & MORE: Featuring two live bands, a command performance by Queen Imani, more former Queens, including, Naughty Mickie, Tequila Mockingbird, Queen Susann Edmonds, Queen Veronika MeowMeowz, goofball judges, prizes, cheap drinks, smoking patio, pool and big screen TV, and lots of dancing. 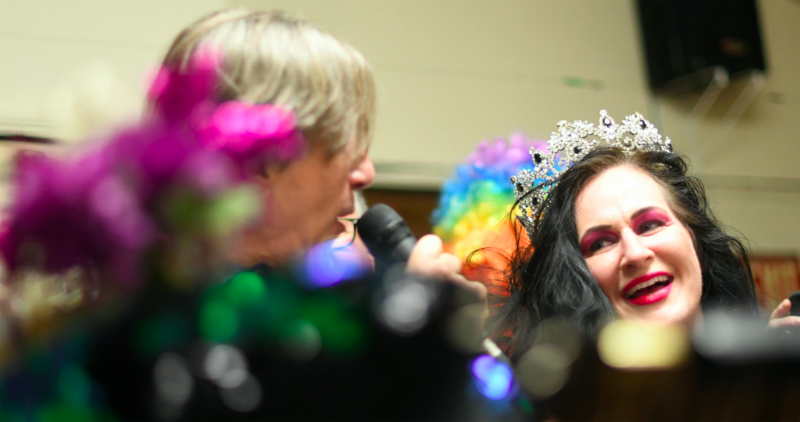 7:00 pm – New Doo Dah Queen is Crowned! Final Results & Pictures will immediately be posted on our social networks and website. FREE to first 20 Queen Contestants to arrive! PLENTY OF AMPLE FREE PARKING!! Even More Info on Queen Tryouts: Organizers staged the first public tryouts in 1998 at a Gothic house on stilts. It then moved to the famed Zorthian Ranch, in Altadena. This and other parodies of Pasadena’s ‘Other Parade’ have fueled Doo Dah’s colorful and controversial life on Colorado Boulevard. The 41st Occasional Pasadena Doo Dah Parade will be held on Sunday, November 18th, stepping off at 11:00am on the streets of East Pasadena. To enter the parade simply go to the website and get the entry form. Call for more information on Tryouts or Entries (626) 590-1134. Public Information Number: (626) 590-7596. Results from the tryouts will be posted immediately on our social networks and website to follow.